Hey, remember when Kate and I went to see a Red Sox game at Boston’s Fenway Park? Well, I sure do. After all, we helped Big D find his lucky bat! If you haven’t heard what happened, you can read about it in the first Ballpark Mysteries book—The Fenway Foul-Up. Anyway, after Big D gave us his signed bat, he let us play on the Fenway Park field. We had to wait for my mom to pack up all her stuff, so I told Kate to go on the mound and pitch to me. She ran to the mound. She didn’t have a baseball with her, so we just pretended. “Kate Hopkins on the mound, getting ready to pitch to the ONE the ONLY MIIIIIIIIIIKE WAAALSH!” I announced from the batter’s box, in my best announcer’s voice. Kate laughed. Then she got serious. She lifted her leg, leaned back, and swung her arm towards the plate as fast as she could. I imagined the ball coming in and as I swung, I knew that I had hit it hard! “SWING AND A DRIVE, WAY BACK, WAY BACK. IT’S GONE!” I yelled. I pretended to drop my bat and then ran around the bases, pumping my fists in the air. “Oh c’mon Mike, no way you woulda hit that!” Kate called out. I jogged out to the right field. Kate ran off the mound and followed me. When I got to the right field wall, I saw something funny. 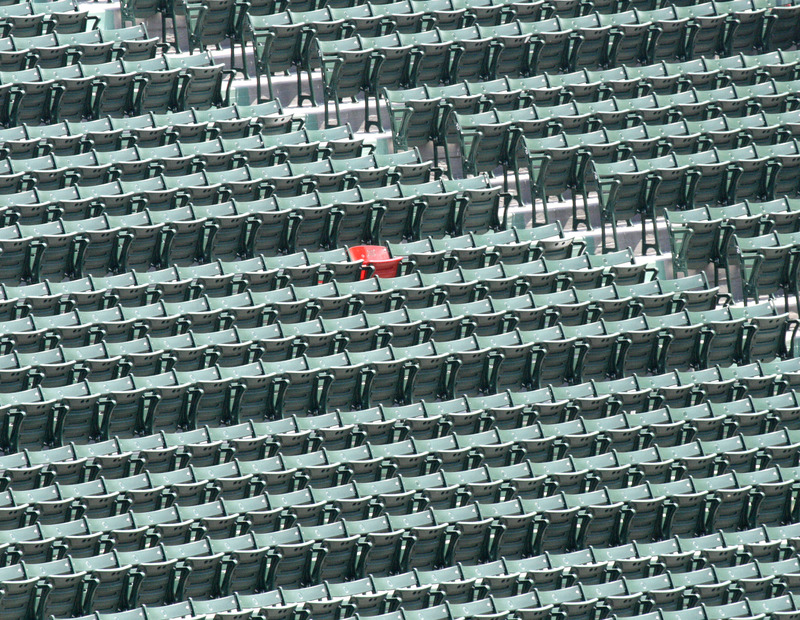 At Fenway, all the seats are green, but right in the middle of the all the green seats was a red one! I yelled for Kate to come check it out. When she made it over, she was still mumbling that I wouldn’t have hit her pitch. But as soon as she saw the red seat, she started blurting out information. “Was he all right?” I asked. I took another look at the empty red seat. I wasn’t sure where Kate was going. But I thought I’d play along, since I had just hit the biggest monster home run ever.